Father Flynn: What do you mean you’re not sure? There is no doubt in my mind that John Patrick Shanley is a brilliant writer. 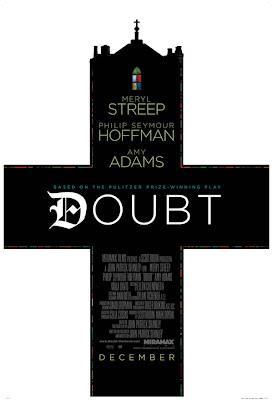 His Pulitzer Prize winning play, DOUBT, also went on to win the Tony for Best Play and has now spawned a big screen adaptation starring three of Hollywood’s most gifted stars. Getting the man who created the characters and who buried such profound dilemmas deep within his words to bring his own play to life on screen must have seemed like a scenario only the angels could have arranged for in heaven. Sadly, the results are more purgatorial than heavenly. Shanley’s unique understanding of the material is evident in every impeccable performance given but his lack of experience as a filmmaker (his only previous experience directing was in 1990 with JOE VERSUS THE VOLCANO) ultimately leaves the film feeling flatter than one would hope, especially when the material calls for a hellishly passionate fire. Still, given the gravity of the subject matter and the manner in which the cast delivers it, I doubt anyone will care. The reality is that Shanley’s inexperience only stops a good film from being great. The genius of the script itself is not only engaging but challenging and provocative. Just as the day begins with mass for so many, especially more so in 1964, so should a film that questions the very foundation of religious belief – faith. As the young alter boys prepare to assist with the serving of mass, one may wonder why any boys are still allowed to become alter boys. The image itself is now almost intrinsically linked to pedophilia and abuse. Still, boys continue to volunteer because they have faith and they are looking for a way to express it. Once the parishioners have taken their seats, they hear a sermon that casts doubt over the decency of the decisions they make on a daily basis. It is ironic really, considering they go this very same place to alleviate these doubts. It is this constant duality and questioning that makes DOUBT so meaningful and faith so fragile. At the St. Nicholas Church School in New York City’s Bronx neighborhood, the young students don’t have room for doubt in their lives. Doubt doesn’t fit in a world ruled by structure and regulation. 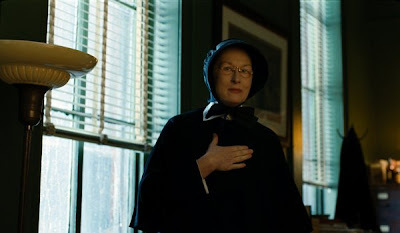 This is especially true when breaking the rules means having to face the most frightening nun I have ever seen, Sister Aloysius (Meryl Streep). One ordinarily might think that people who choose to serve God, or for whom God has chosen a life of servitude, must have a heartfelt devotion to their creator, matched only by their appreciation for the beautiful He created. 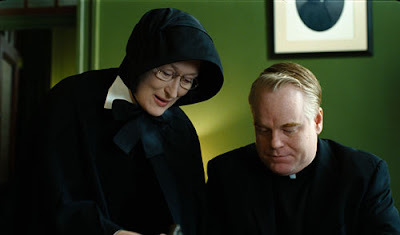 Streep’s Aloysius though seems to solely be on guard for the devil and it is her certainty that drives her to fish it out in Father Flynn (Philip Seymour Hoffman). Having nothing to go on but the loosely drawn conclusions of a fellow nun (Amy Adams), her accusation that Father Flynn may have acted inappropriately with a young alter boy is all she needs to create doubt. We are apparently all too quick to assume the worse but Shanley’s script is far too knowing to wholly confirm or deny the truth. This is the trouble with doubt; unless confirmed, it will never be anything more than a plaguing suspicion. And while you need no proof to believe in God, you need just as little to believe in the devil. This is the genius of DOUBT; Shanley’s parable, for all its intense and transformative drama, can be broken down to a simple flip of a coin, where heads is faith and tails is doubt.